International Migrants Day : KISA calls for the full respect of their rights! On the 18th of December 1990, the General Assembly of the United Nations adopted the International Convention on the Protection of the Rights of All Migrant Workers and Members of Their Families . 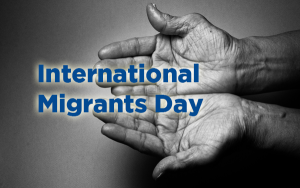 Eleven years later, by the UN’s initiative, December 18th was officially pronounced International Migrants Day. Despite the efforts of this international organisation to secure dignified living and working conditions for migrants, the reality is that today the majority of migrants are still subject to exploitation, discrimination and violence. Already, from the moment they begin the process of transit to their destination country, migrants come face to face with networks of human exploitation and are subjected to all kinds of inhuman behaviours. Unfortunately, however, exploitation, unequal treatment in the workplace, xenophobic violence, exclusion from basic services and the violation of their human rights form the raw reality that they often encounter in their destination countries. Cyprus has failed abysmally regarding the preservation of both the employment and human rights of the migrants that live in the country. It has adopted (in the beginning of the 1990’s) and still maintains an extremely unjust and outdated migratory model which deals with migration as a transient phenomenon, and treats migrant workers as nothing more than cheap labour that the Cypriot economy and society can use and abuse at will. This migration model has cultivated conditions of ultimate exploitation, of blatant violation of migrants’ rights as well as institutionalised and societal discrimination and exclusion. KISA now considers necessary, to use existing procedures for submitting a complaint to the international monitoring bodies of which Cyprus is a contributing member. Such a report will address the systemic and institutionalized direct and indirect discrimination migrants face in relation to the core of their social rights, such as right to social insurance, medical care, and access to social provisions and services. To this end, KISA has already prepared the report which is going to be submitted to the European Committee of Social Rights of the Council of Europe. It is worth noting that the migratory model that Cyprus follows is closer to those that have been adopted by countries in the Middle East. Such models institutionalize the absolute dependence of migrant workers on their employers, often under conditions of ultimate exploitation. Further, in many cases, they institutionalize contemporary slavery, supporting and promoting human trafficking among other things. Over the last few years and especially after the outbreak of the economic crisis, instead of being treated as one of the most vulnerable groups of the population that the state ought to support, migrants have been transformed – by a number of political parties, extreme right-wing MPs and organisations – into scapegoats for all the problems that the Cypriot economy and society has been facing. The presence of the migrant population is intentionally presented as a factor that led to economic problems, such as the increase of unemployment and the “bankruptcy” of state funds. This rhetoric has contributed to maintaining and enforcing the climate in which racism, xenophobia and discrimination against migrants can flourish and be promoted. The replacement of the existing model of migration and the beginning of a consultation to adopt a migration model and policy based on the multicultural character of contemporary societies, as well as on the principles of respect for human rights. The creation of policies for the meaningful integration of migrants in Cypriot society and their equal participation. The creation of an integrated, complete plan to combat and eliminate discrimination, racism, racism-driven violence, hate speech and hate crimes. To adopt all necessary measures and legislative amendments so that migrants have equal access to financial and social rights, such as public healthcare, the benefits from their contributions to social security funds, benefit policies, etc.